We are excited to announce the launch of the Cryptocurrency news site Coincentral.com. Created by a group of people passionate about cryptocurrency, they aim to help educate the masses about the rising popularity around the cryptocurrency world. The site is clean, modern, and easy to use so users find news about exactly the coin they are looking for. They have used their knowledge to position themselves well with a strong mix of coin information, wallet guides, and exchange comparisons to help those new to the crypto world find their bearings. They combine this with a constant update of news from the cryptocurrency world and related to new coins and ICO’s. Coming from the crypto world they understood the need to be fast and accessible from anywhere. To match their vision the site is fully mobile responsive so you can access the latest news from any device, and the articles are using Google’s AMP so you can read the latest news even if your internet strength isn’t that great. We took the site through the Google processes required to make them appear in the Google News, which helps their SEO and solidifies them as a knowledgeable source of information for Bitcoin, Etherium, and Litecoin related news. By using the latest SEO best practices we have helped put them in a position to dominate the cryptocurrency search results. 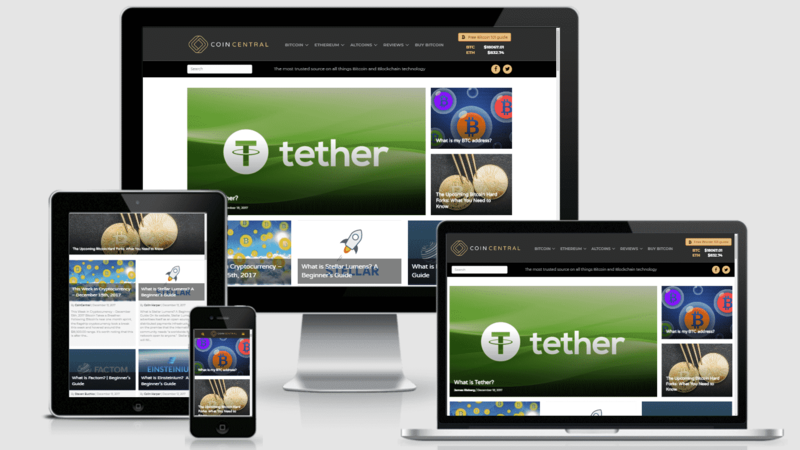 Coincentral’s dedication to an expanding scene is paying off, the site is still in it’s infancy and is experiencing a huge boom in visitors per day. We are excited to see them continue to grow and help educate the world about cryptocurrencies.